It is remarkable that N. Bohr (1913) used the same notation as that given by H. Nagaoka (1904) to illustrate the Coulomb potential of the point center of the atom (nucleus in red) with a charge E in order to describe atomic electrons e (in blue). Furthermore, Nagaoka suggested that the orbits of electrons might not lie in the same plane, that is to say, he was considering a spherical system of each atom. In a sense, Bohr quantized Nagaoka’s atomic model. E. Rutherford (1911) successfully described alpha-particle scattering by the atomic nucleus of gold, while assuming the same Coulomb potential. 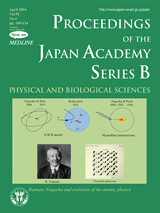 In the illustration, Rutherford’s atom is presented in blue because he assumed that electrons were distributed uniformly within a sphere of radius R. In the article included in this issue (pp. 121-134), Dr. Inamura reveals persuasively that in terms of the Coulomb potential related to the atomic nucleus, models proposed by Nagaoka, Rutherford and Bohr are actually the same, which nobody else has ever noted so far. The N-R-B model stands for the Nagaoka-Rutherford-Bohr atomic model which is here considered to be the most proper naming to present their contributions to the development of modern atomic physics in the early days. 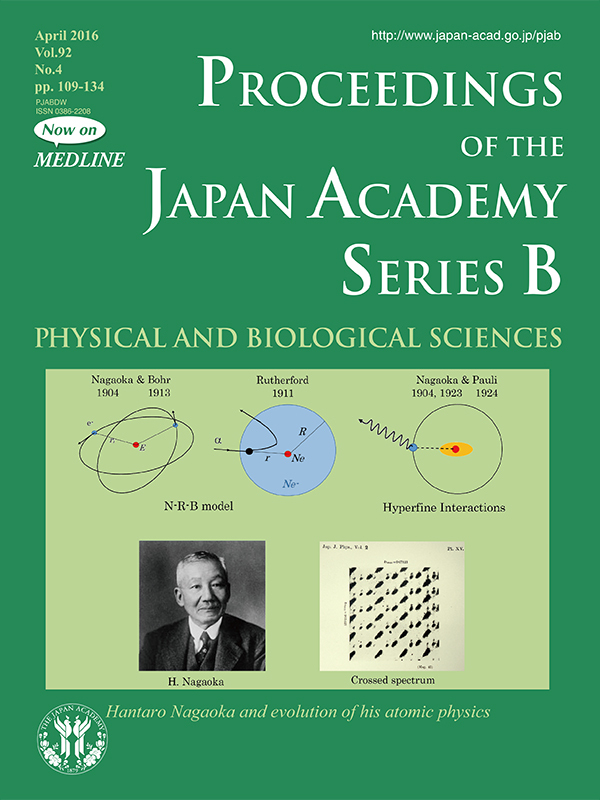 It was H. Nagaoka who for the first time presumed the complexity of atomic spectra (hyperfine structure) to be due to the deformed finite size of the atomic core in his 1904 paper (electric quadrupole hyperfine interaction). And he started preparations for the experiment to observe fine spectra to examine his presumption. After a painstaking two decades, he and his collaborators (1923) published fine structures of atomic spectra observed for mercury and other elements; in the case of mercury they noted unexpectedly small isotope shifts thanks to the crossed spectra (see this article in detail) from which they discussed a probable deviation from the spherical Coulomb field. Internationally, their measurements were highly valued, and W. Pauli (1924) was so inspired as to assume nuclear spin to have a magnetic dipole hyperfine interaction. Unfortunately, this fact had been forgotten by history. In the illustration of hyperfine interactions a deformed nucleus is presented in orange and a spherical one in red: the dotted line means that electromagnetic interactions occur between the nucleus and atomic electrons (in blue) and the wave indicates photon emission from atomic states.